CloudMounter is the definitive cloud manager software for Windows and Mac OS. The all-in-one system utility gives users the ability to mount cloud drives directly to the PC without the need to save files in your computer. CloudMounter offers cross-platform capabilities for power users who prefer working on multiple OS environments, i.e., Windows, Mac and Linux and mobile devices with operating systems such as Android and iOS. Although, the iOS, Android and Linux versions for CloudMounter are currently in developing process and will be released very soon. Laptop owners who want to expand their storage space can use CloudMounter to get extra space from OneDrive (up to 30GB), GDrive (up to 15GB) and Dropbox (2GB). You can outsource files straight to popular cloud services such as Microsoft OneDrive, Amazon S3, Google Drive and Dropbox, and in WebDAV and FTP servers. Need to connect your PC to multiple cloud storage servers? CloudMounter lets you access your files and documents as if it’s physically attached as a local drive. Users can easily upload to the cloud and move files locally from one storage to another without any lag or delay, like they would on their SSD drive. CloudMounter lets you setup data encryption for servers and cloud storage using the latest AES256 encryption standards, reducing the risk of unauthorized access. CloudMounter for Mac is compatible with OS 10.10 and above. Finder integration is seamless and easy. Users will have an easier time using the cloud manager this way. CloudMounter for Windows is compatible with Windows 7 SP1 and above. Users can integrate the CloudMounter software with Explorer and work within a single platform. 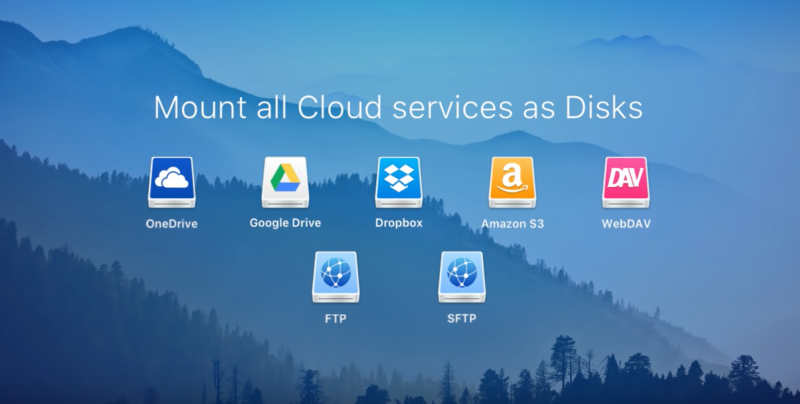 Get ultimate online access using CloudMounter, the all-in-one cloud drive platform for Windows and Mac OS. You can also get CloudMounter on mobiles using Android, iOS or Linux.